Today, we’re thrilled to announce that we’ve taken another step towards that goal. We’re teaming up with Puget Systems to design computers that are optimized for Prospect, our instant 3D-to-VR software, making it simpler than ever to assemble a VR-ready workstation. As a VR-first company, it’s important to us that your VR experiences with clients and collaborators alike are comfortable and productive. Now, obtaining a computer that’s capable of delivering smooth, premium VR is no problem. All 3 of Puget Systems’ new IrisVR workstations - available for purchase starting today - have been custom-tested to ensure the most effective performance for virtual reality, all the way down to the hardware component level. Each workstation is perfect for pairing with an immersive VR headset, like the Oculus Rift or HTC Vive. But our partnership with Puget System isn’t stopping with these VR-ready computers. We’ll also be providing Puget Systems IrisVR Workstation customers with collaborative technical support from AEC, VR, and computer hardware experts, sourced from each of our world-class CX teams. Puget Systems’ Compact IrisVR Workstation is built for viewing 3D models in VR while minimizing the physical space taken up in your office. This workstation is tailored to provide plenty of CPU and graphics performance for interacting with all sorts of 3D models - even large ones. Based on Puget Systems’ Deluge gaming system, the Advanced IrisVR Workstation is designed for experiencing all that immersive virtual reality headsets have to offer. While great for rendering VR experiences, this workstation also provides powerful performance across a wide range of other applications when you aren't wearing an HMD. The Ultra IrisVR Workstation’s tower chassis has room for additional drives and expansion cards in order to better handle virtual reality experiences and game development, art and content creation, and more. The core hardware specs are the same as Puget Systems’ more compact VR computers, ensuring the performance needed to test out VR applications as they are developed. We’re kicking off our Puget Systems partnership with a collaborative webinar on VR computers, headsets, and more. Keep reading to find out more. Ready to learn more about VR? 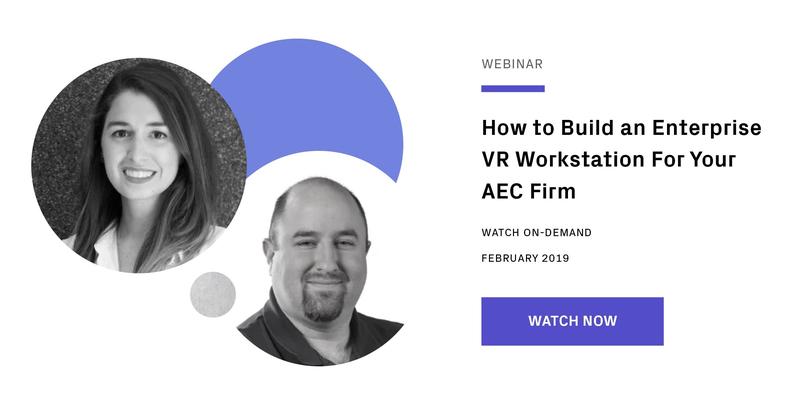 Tuning into our Best Practices Webinar on how to build an enterprise VR workstation for your AEC firm is a great next step. Join us live on Thursday, Feb. 21st, 2019 @ 2pm EST / 11am PST. William George has been working with Puget Systems since 2005. For nine years, he helped Puget Systems customers configure and purchase computers. Since 2017, he’s been researching the applications those customers use - like CAD and VR - and testing them on various types of computer hardware. As our Director of Customer Experience, Ailyn Mendoza acts as a liaison between IrisVR’s customers and the engineering team. She’s worked at a number of internationally recognized AEC firms and helped lead our CX team to a 98.6% CSAT (Customer Satisfaction Rating) through over 10,000 support tickets.